LAKE FOREST, Ill. - The Forester women’s hockey team split a pair of home games against UW-River Falls, the Northern Collegiate Hockey Association’s first-place team, over the weekend (February 9-10). Lake Forest won 3-0 Friday night, fell 4-1 the following afternoon, and is now 9-5-5 overall and 4-3-4 in league play this season. The Falcons are now 13-6-4 overall and 8-3-2 in NCHA games. 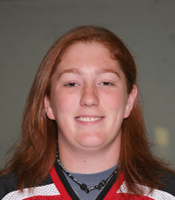 The Foresters took the early lead on Friday when senior Katie Snowden (Toronto, Ont./Willowdale Redwings) scored at the 3:40 mark of the opening period. She was assisted by junior Kerry Gotowka (West Simsbury, Conn./Westminster School). The home team doubled its lead when freshman Maggie Bresser (Fond du Lac, Wis./Waupun H.S.) converted a power play opportunity at 7:39. Gotowka and freshman Brita Irving (Fairbanks, Alaska/Team Alaska) assisted on Bresser’s third score of the year. Snowden also scored what turned out to be the final goal of the game just 71 seconds into the second period. Her seventh of the season was assisted by junior Courtney DeHoey (Chatham, Ont./Bluewater Jr. Hawks), who leads the team with 14 helpers on the year. Freshman goaltender Ryann McCarthy (Lombard, Ill./Team Illinois) tallied 31 saves, including 13 in each of the final two periods, in her first career shutout. She now owns the ninth-best winning percentage in the nation with a 6-1-2 record. She also raised her save percentage on the year to .918. Senior Sally Bevis (Huntington, N.Y./North American Hockey Academy) was in goal for the Foresters on Saturday and stopped 39 of 42 Falcon shots on goal. Her .936 save percentage on the year ranks sixth in the country. River Falls scored the first period’s only goal on Saturday at 14:19 and there was no score in the second. The Falcons scored again at 6:21 in the third before a power play goal by Lake Forest junior Allison Rushing (Seattle, Wash./Seattle Admirals) at 8:15 put the home team on the scoreboard. Bresser assisted on Rushing’s fifth goal of the season. River Falls, however, pulled away with a score at 17:29 and a power play empty net goal with 13 seconds left in the game. The Foresters will be on the road for each of the final two weekends of the regular season. Lake Forest will take on UW-Stevens Point next weekend (February 16-17). Friday night’s game will begin at 7:30 and the teams will face off again the next afternoon at 2:00. UW-Superior will host the Foresters the following weekend (February 24-25).